Thank you daniel this is very eye opening to a guy like me. I have some more saving to do apparently your first year on the road would be very difficult for me to keep up with my bills,rent etc. i see that it def got better for you as time went on. Not to mention the endless amount of experience you got. Im thinking of going to prime for school. I drive now for a local company not big rigs of course but a small box truck and ive met alot of central guys and they all have basically told me to stay away from central. I'm glad it helped. The paychecks are very inconsistent. You really have to hope you have enough money when you're going home for hometime to pay the bills. Some weeks/months we didn't have enough to pay a bill or two because my paycheck was extremely low. But then other weeks I had plenty enough because my paycheck was huge. It can be difficult to predict the future when your paychecks are sometimes 200$ and sometimes even lower. Lets not forget that the cost of living on the road is high. Also consider this. I made .28-.31cpm with my time at Central. Prime pays a lot more so there's no doubt that you'll make more than I did. Central was a great company to work for, I enjoyed my time there but I believe that after a year of experience I should be making more than .31cpm that's why I'm switching companies. Anyways, I'm glad it helped. I hope all the data is easy to read. very easy to read and you are a very organized person. your daily journal was very eye opening. Im not totally torn away from the lifestyle but it did put somethings into perspective. One thing i would have liked to see that brett said in another thread is the simple stuff. like when how often do you shower are you always sleeping in the truck? what are you eating on a daily basis. I'm all about saving money and im a big tea drinker myself so what you did was very simple to me. Well, let me offer a different view. You are young. You do not have a family to support. That is good! It will be great to go trucking. But let's say you like it and decide to stay in the business for "3 years." Around 1 and 1/2 years in you meet this young lady working at a dinner. You talk. You click. You date. OMG, am I really getting married? Next thing you know, you have a child to support. Well there goes going back to school to be a teacher. Things sometimes do not go as planned. I will give you a very personal example. To be honest, I have not told this to any of my friends or family. I wanted to be a firefighter / Paramedic. I started doing Paramedic work in college. After three years of college, I decided to go do it with out finishing. I said I would go back and finish my degree. Well, fast forward, I am now 41 years old. I have three daughter and a wife that depend on Daddy's salary. I am miserable as a Paramedic. I have fought fires and care for the sick most of my working life. The years of taking care of people (sometimes at their worst) has made me jaded. The compassion for other humans is almost gone. When you see things like a drunk driver laughing after he just killed two teenage girls in a wreck takes something from you. My point is, I am in a bad spot. I did not ever go back and finish my degree. Now, I am looking at trucking. I need to make a change. School is too long and expensive because I have to support my family. Trucking will still be there after you finish your degree. Unless, you can not afford to go ahead and get you degree, I say take the education first. 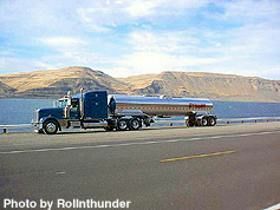 Trucking will be there two years from now! This is such a great read for a local ga guy like me. Ive read this from start to finish and ill admit im a bit upset at no more updates lol. Thanks for sharing im still at a crossroads at which school to pick but you have given great insight on rohel. Stay safe and keep posting! !